A sensitive shampoo for all hair types. Faith in Nature's Fragrance Free Shampoo is an hypoallergenic formulation to gently cleanse your hair and scalp. Ideal if you have sensitive skin. All Faith in Nature's products are GM free. Please note; Faith in Nature have recently updated their labelling. The bottle you receive may have either label. 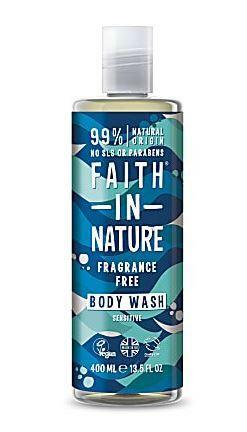 How to use Faith in Nature Fragrance Free Shampoo; Massage gently into wet hair, rinse well and repeat if required. For best results, follow with Faith in Nature's Fragrance Free Conditioner. In case of contact with eyes, rinse with clean water immediately. If irritation occus, stop use. Keep out of reach of children. Packaging; Recyclable bottle. Check local recycling for cap.